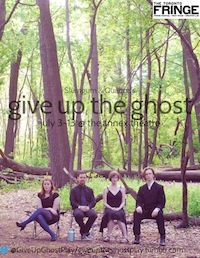 Give Up the Ghost, playing at the Annex Theatre as part of this year’s Fringe, has some great moments. Overall, I wasn’t in love with this production, but I see it as a piece with future potential. It takes place at a cottage in Northern Ontario and follows a group of uncommunicative siblings/relatives as they try to come to terms with the death of their philandering grandfather. The Ontario part is pretty cool, references the characters make to places you may have visited like Huntsville or Santa’s Village are gratifyingly localizing – this is supposed to be “an Ontario tale” and many will likely recognize themselves or someone they know in this piece. That is because the show’s real strength lies in its characterization. Sure some of the ways these characters are written border of “typey” – think slightly crazed wannabe yogi and successful “bay street man” – but they don’t come across that way on stage. The actors do a great job conveying the subtleties of their characters, of revealing their secret inner worlds without relying on their dialogue to make sure the audience gets the point. I found the pace of the show as a whole is a little slow, and the script a little indulgent. It felt long. There isn’t a lot of action, and while I say that the acting carried the show, it wasn’t quite enough to captivate. But, on to potential – there is a certain ability to convey the nuances of the human condition that separates a promising writer from a less-promising one. Playwright Julia Haist gives us great glimpses of her promise. The script needs more work before it can be called successful, but this team is on to something, and that thing is real, honest, and genuine. The Annex Theatre is on Bathurst St, not Bloor West. Yikes! Thank you for bringing that to our attention, Janet!